Although tongue-in-cheek, it really is relevant. You can’t just throw a tantrum. You can’t just flail your arms and yell at a coyote who is trying to message a dog to keep away. Coyotes become habituated to this treatment by humans and, over time, will ignore it. After all, it isn’t something that actually hurts them. There is ONE CAVEAT which you NEED to be aware of: A coyote will put its life at risk to protect pups and a den area. IF a coyote absolutely doesn’t move, it’s best for you to move on rather than provoke an incident. 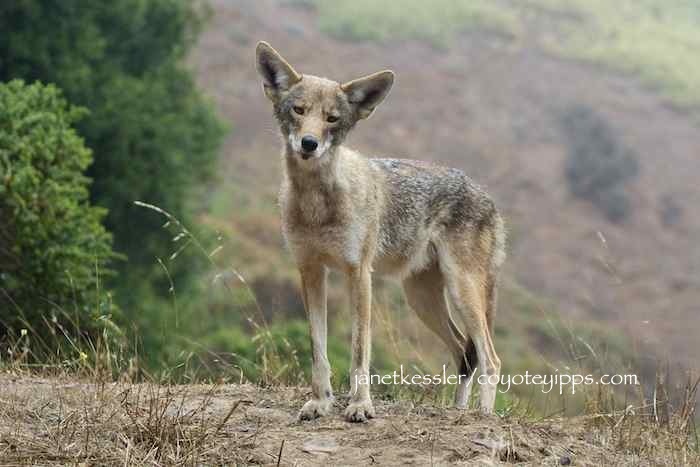 If the coyote does not respond to your charging at it, make sure your dog is leashed and walk away from the coyote and out of the area — do not run. I’ve already pointed out that “harassing” a coyote by “making noise”, “flailing your arms” and “looking big” — is not a fail-safe technique to make them move out of your path. After a time, it does not work because coyotes get used to it — habituated to it — and think it’s just a very quirky human behavior. They know you mean nothing by it because there are no adverse consequences for them caused by your yelling or flailing your arms. However, actually approaching forces them to move away from you, and doing so menacingly while making eye-contact is something they understand. Since they do not want you to get close — they will move. You could speed the process up by adding noise, such as clapping and yelling, or by tossing a small pebble towards the coyote (not at him so as to injure him). Again, this works unless there are pups around. So, “lick your chops” and act as if you’re out to get them if you have a need to move a coyote away from your dog or out of your path. Please see the demo of this in “Coyotes As Neighbors”, a slide/video presentation on coexisting with urban coyotes.